Hand Readings of famous people: Aishwarya Rai's hands show that she is no ice maiden! Aishwarya Rai's hands show that she is no ice maiden! of her loved ones. If her loved ones forget her birthday, she is likely to be hurt although she may not express it. She likes appreciation as much as anyone else, in fact, expects it. Her hand has long lines, both that of the heart and the head. The heartline enters the mount of Jupiter (the mount below the index finger) and is low-set. The headline is long and sloping and appears to have a large fork. The mounts are not highly developed, and the Mars mounts seem underdeveloped. The Moon mount is significant though, relatively speaking, and more enhanced on her right, active hand. The left passive hand also has similar long lines. The hand overall seems quite flexible with long fingers, rectangular palm, rounded tips and a conic thumb which is held close to her hand. The Mercury (little finger) is long and the most of the third phalanges are slightly thick. All her fingers are, in fact, quite good in strength. The shape of her hand and fingers shows that she is an intuitive, empathetic and sensitive person, the type of person who could well be immersed quite deeply in her own world, a world of her emotions. She is the kind who wouldn’t like confrontation and emotional suppression is seen on her hand. This can lead to misunderstandings as she may not always express her true feelings. Her love tends to be idealistic. She would not marry anyone just for the money or position. That is simply not in her nature. Love and ideals are too important to her. People like her are not extremely ambitious, in the sense that they will never put ambition above family. Although the feeling side of her is strong, she is also fairly strong-minded and can be headstrong at times. Her heart does not rule her head. Intelligence and imagination are shown. It is almost as if she has two sides to her personality. Her thumb shows an abundance of reasoning powers, a normal will and a kind of refined diplomacy. She is a flexible person too, although quite impressionable as well. While Aishwarya's hand is balanced, it seems to lack aggression and the kind of steely hard nature that is required to survive in a career like hers. She is a little too sensitive. Combine this with her feeling of closeness to family and it would be easy to push a woman like Aishwarya Rai into a state of domestic bliss. At the same time, it would be easy to push her into working after marriage too. She will try hard to fulfil the expectations that loved ones have of her. This can make her a pushover at times, particularly as she does not express her deepest feelings. People who have seen her in public might have noticed that she appears strained and uncomfortable. Being in the public eye does make her inwardly uncomfortable and this does seem to indicate that she is not suited for a career in the public eye. She is a private person and is not naturally suited to a public life. She would have made a good professional where she could have used her mental abilities. Her hand shows a talent and liking for art, literature, drawing, and architecture. She could have excelled in almost any profession which requires the use of analytical abilities and thinking. She is a very capable woman. Her beauty catapulted her into a modelling and acting career. She does enjoy celebrity and fame – who wouldn't? She enjoys attention, likes money, but is not avaricious. Some doubts have been raised about her acting talent. Her hands do not show that she is devoid of talent. She is sensitive, refined, hard working and she is could be good at mimicry. And her intelligence, determination and mental agility would help her in her career. Through hard work and professionalism, she can deliver results. A good teacher (in her case, the right director) can bring out her best. On her own, she would find it difficult to emote. Or some male Bollywood stars like Hrithik Roshan, Aamir Khan or The magic behind Rajesh Khanna's super stardom who have also had their hands read on this website. Or check out Amitabh Bachchan's hand analysis or the hands of other Bollywood or Hollywood personalities. There is something special in Ash beyond mere physical looks. This quality makes her shine when others fade by exposure and age. Anonymous, I know what you mean. I like Ash too. There is certainly something about her, it's some sort of magnetism I think. Guess what you say about her acting is true...her acting in Tamil movies has been good..and yes she was good in Guru too, sings of good direction? Vishesh, I have hundreds of real hands with me which I have read in person, of people I know. I have been reading hands for years and years, although have been taking photos only in the last decade or so. Before that it was prints, with stamp pad ink and at times a roller. I have prints of hands of friends of mine of more than 25 years ago. Its interesting to see their hands now, and see the changes. This is my first comment and I chose this article because I like Aish. I know, she is an average actress but I've always felt she is a compassionate and warm person, there's something ethereal about her. I will be reading your other articles and giving detailed comments when I have the time. See ya and keep up the good work! Thanks rags! I agree with you about Aishwarya. I like her too and enjoy seeing her on celluloid. In fact that was one reason I chose her too! And I look forward to seeing you here again. You will have to bear with the comment moderation though, because on this blogger platform either you allow all commentators or you allow none. That is the sad part! I like Aish too and feel it is not merely her beauty that makes her shine. It is something beyond that. It is the strong belief she has in herself and all the love that she has for everyone out there. She is a truly beautiful woman, inside and out. Love can dissolve all negativity there is, and gratitude brings about the most vital human compassion existent. Aish is the epitome of eternal beauty. And Nita, is it true that our palm lines change from time to time as our thoughts, beliefs and perceptions change? Yes ofcourse Anonymous. Not just the lines of the hand, but the shape of fingers changes as well. Some people change less than others, but almost invariably we all change in some way or the other. As we change our destiny changes. Hullo Anonymous. I will look up pictures of Rajneesh Osho and analyse his hands. If pictures of his full hand frontal view are available then it will be no problem. im a dieheart fan of aishwariya rai im very happy to know about her may be its right how could i know? shouldn't you be reading the left hand because she is a girl? Anonymous, That is just superstition and not accurate, not true palmistry. Gender has nothing to do with it. I don't like Aishwarya Rai. I don't know why. But I just cannot like her. Not because she isn't a good actress or not because she isn't beautiful or talented or good-hearted or whatever. I just cannot like her. I still wonder why! Is it jealousy? That's because I'm seldom jealous of others, so I find it strange. Anonymous, I don't think it is jealousy, not if you are seldom jealous of others. Anyway, you don't have to like someone because she is beautiful, talented or good hearted or whatever. "Liking" someone is subjective. At times it is difficult to pinpoint the reason. I am sure there is a reason why you don't like her - maybe it's because of her mannerisms, maybe because you like some other actress who is her rival, maybe because she is not your type of beauty or some other reason. i have a question for you. I have been reading palms for a couple months now and my knowledge is very elementary. I have heard and seen the similan line, and I have seen the impacts of it also. I looked at my left palm today (i dont generally read the left and rarely do i read my own palms) but quite shockingly there are 2 forks originating from the heart line , meeting with the head line and forming a square. Do you have any opinion on the implications of this square? poornima, a square cannot be formed with any of the main lines. If it is formed by chance lines it is significant if it is over a break or any other defect as it is a sign of protection. The left hand is very important. Comparing the two hands will tell you what traits are developing and this is of immense help when you advise the person. I think it's best not to read one's own hand in the beginning. In palmistry interpretation is everything and it is difficult to be objective about one's own hand. This applies especially when one is starting out. Ma'am, Can you please confirm if following picture's hand is Simian or not? 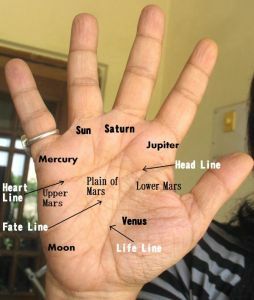 I am confused , since some other palmists on a palmistry forum have said that this hand has a simian line. But we can clearly see a headline branching out. It is like a Simian line because of three reasons. 1) It is low on the hand 2) It goes across the hand from side to side almost 3) the headline is barely existent. The most important reason is that the headline is almost non existent. The sloping line coming out of the lifeline cannot be considered the headline, but a small horizontal line underneath the Sun finger can be considered a small part of the headline.Look at the left hand and you will understand how the lines have changed. The first part of the headline is visible on the left hand, but not on the right hand. The heartline on the left hand is higher up and also slightly shorter. All these point to the fact that the heart line is now doubling up as the headline, taking its place and doing its work so to speak. Yes, strictly speaking one can say it is not a Simian line because a tiny part of the headline under the sun finger does exist, but that would be incorrect. Palmistry is not mathematical, it is about interpretation. At times lines do the work of other lines, and when the heartline is doing the work of the headline, even if partly, it is a simian line. Thankyou Ma'am for your reply. I wonder, then which line is the line branching out from life line? Is it second fate line? I need a higher resolution photograph to come to a conclusion. But there are many possibilities although it is certainly some form of the fateline. To get an answer one has to examine the place where the line touches the lifeline to see whether the line is flowing out of the lifeline or is cutting it. Also to check if there are two lines involved, if it is a line from the lifeline clashing with the fateline. From the colour, consistency and shape the line is the fateline clashing with a horizontal line coming from the lifeline.